Are you a lover of all Harley Davidson? If you are, these Harley Davidson mud flaps will look great on your truck, car, SUV, or minivan. They are universal mud flaps, but will fit virtually any vehicle. 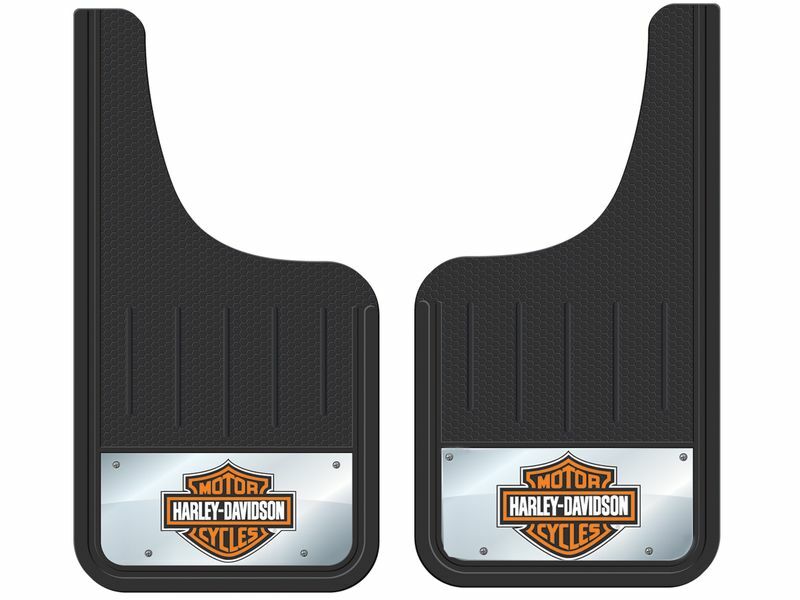 Show your Harley Davidson pride and keep the mud down at the same time with these car and truck mud flaps. There are two sizes available so select the ones that you think will look the best. Both sizes are sold as a pair. Plasticolor Harley Davidson mud flaps are available for the front or rear of your vehicle. With an easy fit design you'll have them installed in no time. Even if you aren't on your Harley, others will know you're a Harley Davidson guy. Get your mud flaps today! All Plasticolor products are warranted for a 12 month timeframe from the date of purchase relating to issues involving the material and manufacturer defects. Issues involving normal wear and tear of these products are excluded from the warranty. Modifications and changes made to mud flaps (such as drilling, cutting, or sanding) are not covered by this warranty. Please call us at 1-877-216-5446 for more information.